It got hot this week. I shouldn't be complaining. I can't really call it hot. It's been in the 80's, but after a strangely cool and non-humid spring, anything remotely resembling heat is equated with sadness and thighs sticking to leather couches. 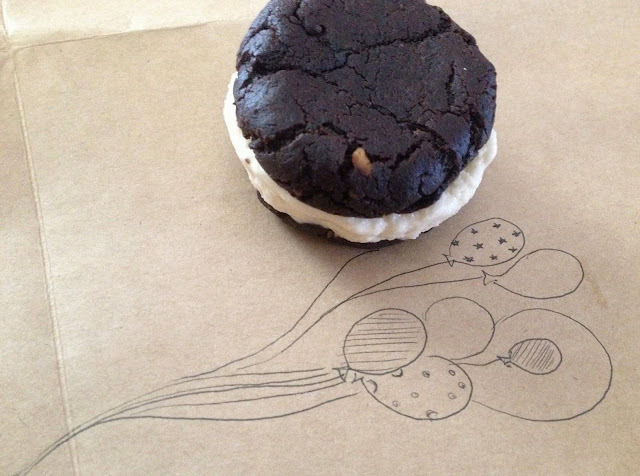 Heat also puts me immediately in the mood for ice cream sandwiches...the kind with the chocolate cookie that sticks to the pads of your fingers so that by the end of dessert time you're gnawing at your finger-tips where half your cookie stuck, apparently. I mean, who really keeps the paper on? A hot cookie mess: that's my kind of ice cream sandwich. Many healthy eating plans sound amazing until you realize that ice cream isn't included. Sure, you can make a decent excuse for ice cream out of frozen bananas...but in the end it still tastes like banana. Banana has its place in the world most definitely. But it's place isn't to constantly haunt my ice cream like those few times the bananas I left near the bread-box flavored every sandwich for a week. The ice cream sandwich craving came on strong, Tuesday. I dove into the grocery store on the way home from work and spent the evening working on something which I'm prepared to call The Ultimate Non-Ice-Cream Ice Cream Sandwich. 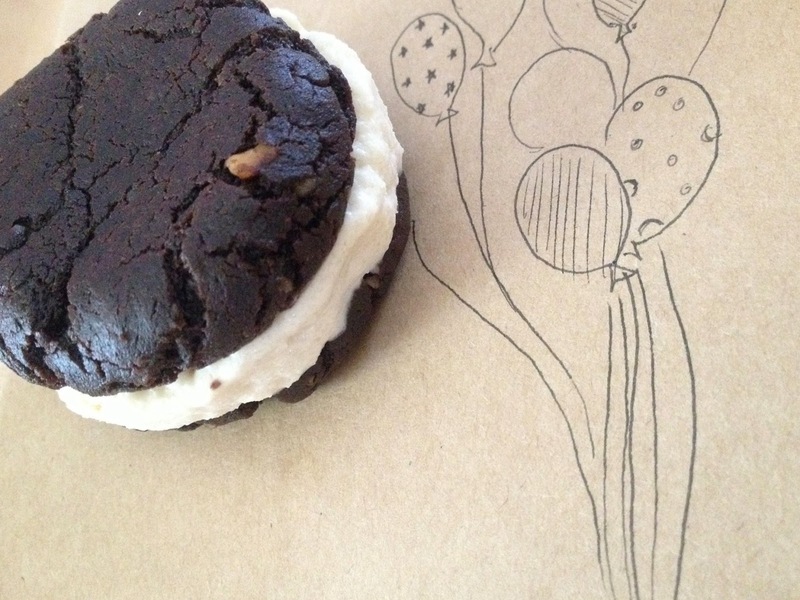 The cookie: fudge perfection. The coconut milk ice cream: sugarless but lightly sweet, creamy and delightful. This recipe is slightly time-intensive because the ice cream is custard-based which requires the double-boiler method, cooling of the custard, then freezing of the custard, so just be sure to start this recipe the day before you intend to indulge your ice cream sandwich craving. The results, though, are completely worth the relative trouble of waiting. Creamier than what you usually think of when you think of dairy-free ice cream. 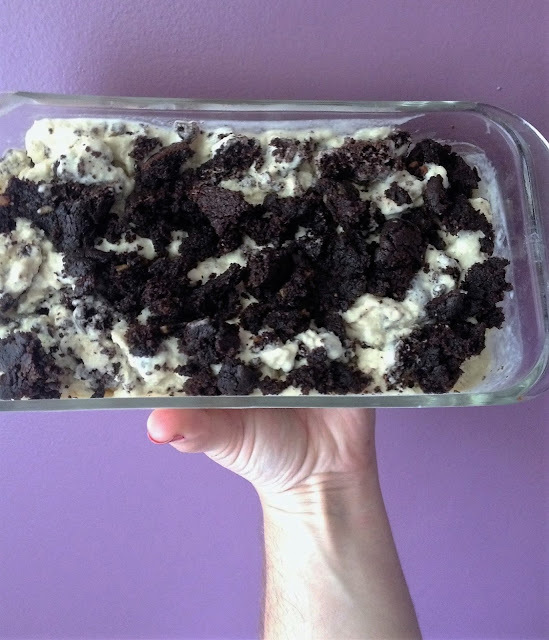 Confession: I got impatient and tried to fill my sandwiches before my ice cream was thoroughly frozen and they melted and oozed so I went all Rambo on the project and turned it into cookies and cream ice cream, which is basically the best idea ever anyway. In a double-boiler, mix coconut milk, vanilla, and salt. Stir, heating until very hot but not boiling. In a separate bowl, lightly beat eggs. Temper the eggs by ladling in a spoonful of the hot coconut milk and stirring. Add another ladle of milk, and a third. Slowly add egg mixture to coconut milk over the heat and continue to cook in double-boiler, stirring constantly till mixture thickens. Remove from heat and cool on counter-top of fridge. When cool, process in a normal ice cream maker or pour into a shallow pan and freeze, stirring every half-hour so as to break up ice crystals and achieve a smooth consistency. Mix all cookie ingredients except melted chocolate in a food processor. When blended, add chocolate and mix well. Put cookie dough into fridge for 1 hour. Preheat oven to 325 F. Roll dough into golf-ball sized balls and bake 4 minutes. Press flat with the back of a spoon and bake an addition 3-4 minutes. Cookies will be soft so allow to cool on tray for a couple minutes before transferring to cooling rack. Assembly: Scoop ice cream between cookies and either wrap in plastic wrap and freeze for later, or enjoy right off the cuff. Alternatively: Break cookies into the ice cream pan and roughly mix. Voila: cookies and cream ice cream richer and more decadent than wearing Versace to the film festival at Cannes. 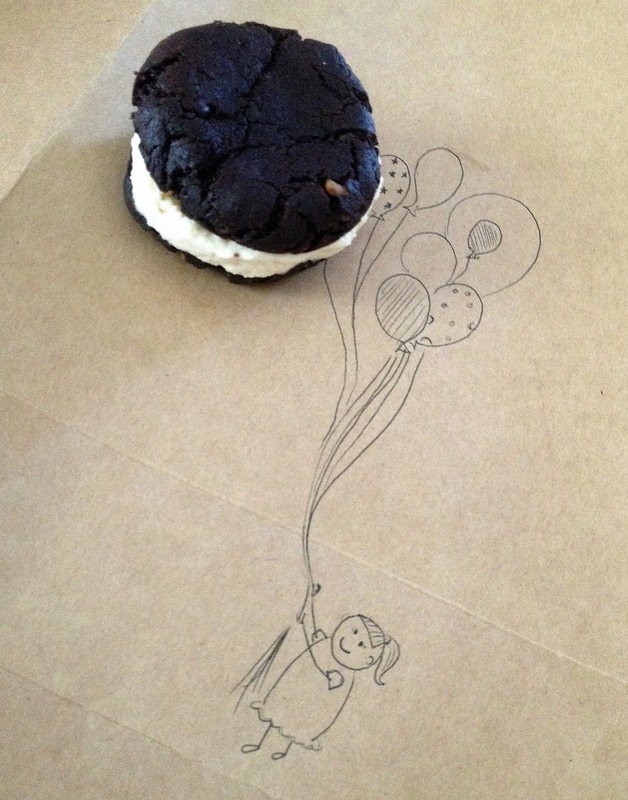 This might just be my favorite thing to do after taking the requisite ice cream sandwich photo.